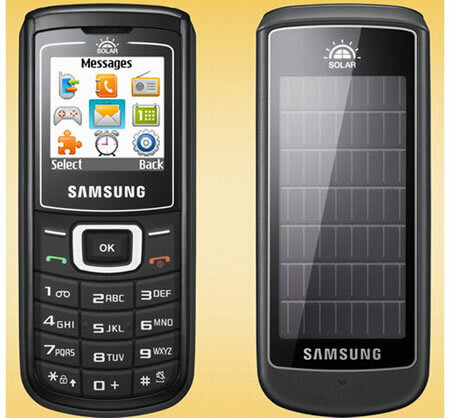 As an effort towards green environment initiative, Samsung, the famous Korean mobile phone manufacturer has just released a new solar-based mobile phone to consumer market space. Named as E1107, it is claimed to be the first commercial ready solar-powered product targeted for users that doesn’t require fancy feature but prefer a simple eco-friendly mobile device while on the move. Physically, the E1107 is quite similar to E1100 model design except being enhanced to support solar energy conversion through solar cell built into its back panel. Backup with a relatively low Li-Ion 800mAh battery pack, it can be recharged through a normal travel charger or with built in solar panel which converts solar energy into electrical current to power it up for normal operation. According to manufacturer, an hour under the sun can easily extend the talk time up to 10 minutes which is quite sufficient even if you forgot to carry travel charger but need some urgent talk time during emergency situation. Some other feature sets include dual band 900/1800 GSM support, 1.52-inch CSTN display with 65K colors resolution, FM radio, Flashlight, Mobile Tracker and many more. The entry level E1107 solar phone will be available in Asia, Europe and Latin America by this month and at an estimated price of $59 (around 2799INR in India), it is expected to trigger more new solar powered mobile devices from other manufacturers.